Esther Holewa is customer service sales representative, Schuler Inc., Canton, MI: 734/207-7200; www.schulergroup.com. As the U.S. manufacturing sector rebounds from the recession, metalformers face several obstacles to maintaining efficient and cost-effective press-shop maintenance and repair schedules. These obstacles can create a critical pinch point that can lead to extended, unplanned downtime—and expensive repair costs. Learning from recent critical situations at other facilities, and understanding the root causes, can help stamping operations create a plan to minimize their own risks. These obstacles are local as well as global in nature. Locally, press production requirements have increased while many press components have become obsolete. And, these presses often are allowed limited downtime for maintenance. In addition, most press shops are supported by a reduced post-recession stock of spare parts, with fewer skilled people available to work on the equipment. Globally, we see increased demand for press-system controls and components required for maintenance and repair. This increased demand has created in some cases extremely long lead times to obtain replacement components, as long as several months. Such delays make it virtually impossible to respond quickly to emergency situations. In the event of a catastrophic failure of a key press component, the component may need to be reengineered due to obsolescence, in order to be replaced and retrofitted. What seems like a quick fix can become an extended delay, due to the need to design a robust solution for a component no longer available. What can a company do to mitigate its risk? Here are a few tips to keep your presses running at peak performance. Going through this process, a metalformer can identify the information necessary to develop a critical part- or unit-exchange program based on the current environment; set maintenance work instructions with a schedule; and establish preventive-maintenance inspection protocols to mitigate the risk of extended downtime. Every part has a life cycle. For example, press electrical components have a life of seven to 10 yr. As new technologies are developed, old ones become obsolete. In new press systems, these components often are designed differently, or even removed altogether. What is an acceptable time for this component to be out of commission? Understanding and preparing for obsolescent parts is crucial to maintaining uptime. Identifying press components that are obsolete and no longer available can help a metalformer schedule modifications and adjustments in advance of a problem. Lacking a direct replacement for an obsolete component, stampers should plan the required engineering changes in order for the equipment to accept an alternative component. Not only will such planning allow a company to budget for related costs of such projects,, but it also allows a company to maintain optimum press uptimes by scheduling the repairs during regular downtimes. Metalformers often can leverage system similarities and identify critical components across the continent, or even the globe, to ensure quick response. Creating a common-parts exchange program with an OEM, for example, can make it easier to respond to service needs. For example, if a common architecture is not already present with your company, such architecture can be planned for press-safety systems, automation equipment, drives, cushions, controls, etc. This practice will make a system relatively future-proof and increase response time when service or repair is needed. Also, we reduce pressline downtime and avoid costly part-production delays. The service life of several common components (mechanical and electrical) recently has plagued the uptime of several press shops. Such components should be assessed for future obsolescence (see the table, Suggested Components to Assess for Planned Obsolescence). For example, delivery time of a particular pump used in one press shop recently increased from six weeks to as long as 12 months. Yet another stamper found that when a motor was no longer being manufactured, it faced a lead time of more than 16 weeks to get its press back up and running, accounting for engineering time, the time needed to update specifications, and additional onsite assistance. And in yet another instance, a stamper found that a minor component used in a press electrical system no longer was being manufactured. This led to reengineering of a used component to employ as a retrofit—a solution that took 12 weeks to develop and implement. Bear in mind that timely supply of replacement parts is not completely under the control of the component suppliers. The extended time to obtain a replacement part can be due to technology changes, high demand or new part designs. Critical components to evaluate include PLC controls, motors/ drives, electrical components, pumps, valves and seals. It is important for NAFTA-region press shops to act now. The first step to avoiding unplanned downtime is to start with an equipment assessment by a press expert for the entire operation. 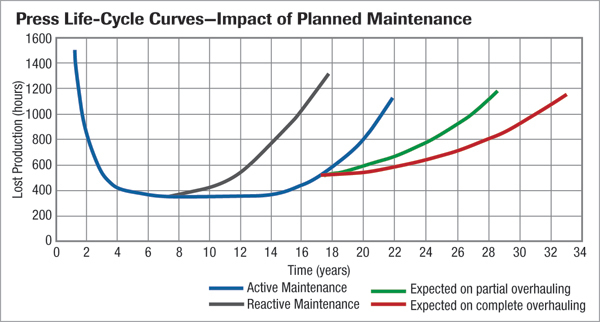 From this assessment, create a maintenance plan that identifies common problem areas and anticipates the need for part or subsystem replacement. By using this strategy, companies can plan downtime to repair parts that may become at risk during high-output periods. In fact, this enables service providers to preorder parts with long lead times, and schedule time for press rebuilds or overhauls for outdated components.